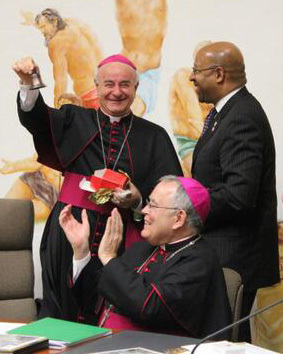 Archbishop Vincenzo Paglia, president of the Pontifical Council for the Family, which sponsors the World Meeting of Families, rings a replica of the Liberty Bell, a gift from Philadelphia Mayor Michael Nutter and Archbishop Charles Chaput. Following are the full remarks of Archbishop Charles Chaput and of Archbishop Vincenzo Paglia, president of the Pontifical Council for the Family, during a press conference March 25 at the Holy See Press Office at the Vatican. The archbishops spoke about the planning efforts for the 2015 World Meeting of Families in Philadelphia. Before I do anything, I want to thank His Holiness, Pope Francis, for confirming Philadelphia as the site for this great family event in 2015. He embodies the message of mercy and joy that lies at the heart of the Gospel. His enthusiasm for life and his compassion for the genuine needs of people have inspired us to focus on our common mission of love, and how love so much enlivens all families and its respective members. For such reasons, we are working on a Preparatory Catechism, not just for our Catholic faithful, but also for all people of good will, as we underline the beauty and truth of family life which, as the most privileged place of love, provides for a dynamism of reciprocal human affection that fills every home and family member with a unique and invigorating light and warmth. We are very pleased to be working with the Pontifical Council for the Family, the Holy Father’s office that has responsibility for the care of families globally. And we sincerely pray that Pope Francis will be able to join us for our celebration next year. Gatherings like this are a tremendous source of joy. They also demand quite a lot of planning and a great deal of work. They draw many thousands of people – in this case, many thousands of families with children of all ages – and their magnitude poses some very special challenges. But these events also become moments of grace. They have the power to transform, in deeply positive ways, the whole public community. That’s an important point. The World Meeting of Families is meant to be a gift not just for Catholics in Philadelphia, but for every person of good will in the Commonwealth of Pennsylvania, the surrounding regions and the wider world. Everyone with a generous heart is welcome to be a part of it, and I’ll be working closely with my brother bishops in the months ahead to encourage families across the globe to come to Philadelphia in 2015. Philadelphia is one of my country’s greatest cities and uniquely rich in America’s history. It’s where the United States began as a nation. The political ideals conceived in Philadelphia have served human rights and human freedom for more than two centuries — not just in the United States but everywhere. Pope Francis has already stressed the importance of human dignity in Evangelii Gaudium and elsewhere. And he’s placed a special emphasis on the strength of the family as a guarantee of human flourishing. The more we encourage and support the health of families, the more “alive” society becomes. Philadelphia is also an American Catholic icon, with two great American saints. Mother Katharine Drexel spent her life serving African Americans and North American Indians. And Bishop John Neumann created parochial schools that became a national model and helped poor immigrant families educate their children. As a result, Philadelphia has a great Church legacy of Catholic education, and many decades of service to immigrants, minorities, persons with disabilities, the elderly, the hungry and the poor. That service continues right now, today, in all our Catholic social ministries. The Church in Philadelphia is also very much a community in need of renewal in the wake of the sexual abuse crisis of the past decade. In that sense, Philadelphia is a snapshot of the Church globally. We have a duty to help abuse victims and their families to heal, and to protect children and young people from harm in the years ahead. At the same time, the Church still has the duty to help people find God and to live their faith with joy and conviction. The story of repentance and new life was the story of ancient Israel, and it’s the story of the Church at her best throughout history. I think faithful Catholics everywhere know that. And they long for a chance to deepen God’s presence in their own families, and to share the Gospel with a world that urgently needs hope. That’s why – with the help of God – the World Meeting of Families in 2015 will achieve everything God intends for it. I want to thank Governor Tom Corbett of Pennsylvania and his wife Susan for being here today, and Mayor Michael Nutter of Philadelphia, along with Deputy Mayor Everett Gillison. The Governor and Mayor have very kindly agreed to serve as honorary co-chairs of the World Meeting of Families. I want to say publicly that Philadelphia’s Catholic community is very, very grateful for your presence here today and for your support. I’m also very grateful to the major interfaith and ecumenical leaders of Philadelphia’s business community who have joined their Catholic colleagues in serving as co-chairs of the meeting’s Executive Leadership Cabinet. They honor the Holy Father and our world meeting with their support. It’s a wonderful coincidence that this global gathering of families will happen exactly 50 years after the close of the Second Vatican Council – a council that opened the Catholic Church to the Jewish and wider Christian community in a decisive way. With us today are cabinet co-chairs Mr. Daniel Hilferty and his wife Joan; Mr. James Maguire and his wife Frances; and Mr. Joseph Neubauer and his wife Jeanette Lerman-Neubauer. Mr. Brian Roberts and Mr. David Cohen were unable to join us in Rome today because of schedule conflicts, but I want to offer them my sincerest thanks as well. I also want to acknowledge the extraordinary service of Bishop John McIntyre, who has general oversight of the event for the Church in Philadelphia; Father William Donovan, our Archdiocese of Philadelphia liaison here in Rome working with the Pontifical Council for the Family; Mr. Robert Ciaruffoli, president and board chairman of the World Meeting of Families/Philadelphia corporation; board member and business leader Mr. Eustace Mita and his wife Susan; Mrs. Donna Crilley Farrell, the executive director of our Philadelphia efforts; and Mr. Brian Tierney, another great supporter of the World Meeting of Families, and his wife Maud. Much work still needs to be done in perfecting the design and content of this event. But we very much want the World Meeting of Families in 2015 to be a moment of hope and joy for every person and every family that attends. It’s especially fitting that next month Blessed John Paul II will be canonized a saint by our Holy Father. It was Blessed John Paul II, the Pope of the Family, who first proposed these global meetings on the family. And we in Pennsylvania are grateful to continue this great tradition of reaffirming the importance, the beauty and the joy of Christian family life. To that purpose, we’re bringing together the best experts we can enlist to address the pastoral, social, economic and cultural challenges that families now face. In the end, our goal is simple. We want to help families strengthen their family life in very practical ways. And so I’d ask everyone here today to pray that God will guide our efforts in a way that benefits his people, and proves worthy of the families and communities we serve. As President of the Pontifical Council for the Family, it is my great honor to welcome the Archbishop of Philadelphia, the Most Reverend Charles Chaput, the Mayor of Philadelphia, the Honorable Michael Nutter, and the Governor of Pennsylvania, the Honorable Tom Corbett, and all the members of the delegation that has come to Rome for the official start of preparations for the World Meeting of Families to be held in Philadelphia from the 22nd to the 27th of September in 2015. For myself, and on behalf of the Presidential Committee, the Members and the Consultors of the Pontifical Council for the Family, I thank them most sincerely for the welcome they are giving to this event that is extraordinarily significant in the life of the Catholic Church. As we know, His Holiness Pope Emeritus Benedict XVI announced the choice of Philadelphia at the conclusion of the 2012 World Meeting of Families in Milan, and Pope Francis confirmed it in his Letter to Families dated February second of this year. The Philadelphia Meeting will be held at a particularly important time for the Church. Pope Francis, in fact, has decided to focus all of Catholicism on the subject of the family. Last month, he called a Consistory, an official gathering of his Cardinals, to hear their advice on family concerns. Next October, he will preside over a Special Meeting of the Synod of Bishops to study the question of “The Challenges to Families in the Context of Evangelization;” and that same theme will be pursued in the Regular Meeting of the Synod scheduled for October of two thousand fifteen. Likewise, we cannot forget that this moment in the Church coincides with the process of analysis and discussion undertaken by the United Nations this year to celebrate the 20th anniversary of the International Year of the Family, and we must not underestimate the fact of the geographic proximity between the ecclesial event taking place in Philadelphia and the debates being held in the headquarters of the United Nations in New York. That proximity is a providential call to religious and civil institutions to work together to bring a better future to all the families of the world. The Philadelphia meeting is looking first of all to gathering the Churches of the Americas, and it is encouraging participation by all the diverse cultures, from Alaska to Tierra del Fuego, that people these vast continents. In addition, there is no doubt that the presence on the Chair of Peter of the first Latin American Pope makes the event even more meaningful. The Pope who bears the name of Francis of Assisi, the saint of universal brotherhood, the Pope who was called “from the ends of the earth,” is already walking with us as we prepare for the 2015 meeting. We see what he has already done just this past year: The Family Pilgrimage of the Year of the Faith last 26th and 27th of October; the 21st Plenary Assembly of the Pontifical Council for the Family three days before, which studied the Charter of the Rights of the Family on its 30th anniversary; the meeting between the Pope and engaged couples in St. Peter’s Square for Valentine’s Day this past February 14; the Letter of the Pope to Families and the Consistory on the Family that I mentioned above. These are all milestones on a path that is being walked by men and women from all our churches in the world, nor can we fail to mention the questionnaire submitted to all the world’s dioceses to facilitate sharing in this journey. This is what we will do as we look toward the Meeting in Philadelphia: we will be there for all the families of the world with a shepherd’s care that is “wise,” and “brave” and “full of love.” Wisdom in understanding what families face today, bravery in taking on today’s many and complex problems; and love in helping to resolve those problems in the light of the Gospel of the Family and of Life. We will deal with many issues in our wise, brave and loving work together: theology of the family, married spirituality and holiness, ecclesiology and pastoral care for families, the family in contemporary culture, immigration and the family, the family and ecumenism. We would also hope that the Meeting in Philadelphia sees a broad and active presence from the other Christian Churches and communities, as well as from representatives of the world’s other Great Religions, together with other men and women who, though not religious, are committed to bringing peace and good will to our world. May our coming together for the family encourage all peoples to remember that we are one family of humankind and that it is together as a family that we must walk the path to true happiness.